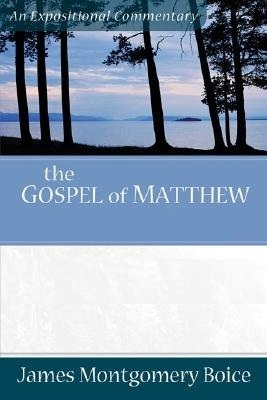 The Gospel of Matthew, said James Montgomery Boice, is "the first of the Gospels, the longest, the most Jewish, the most evangelistic, and, in many was, the most compelling." This two-volume expositional and inspirational commentary on the Book of Matthew integrates rigorous scholarship and clear communication. It will inform and help a wide range of readers--from serious Bible students to interested laypersons--understand and apply the truths found in the text. Boice not only explains the meaning of the text verse by verse and section by section, he also relates the text's concerns to the world in which we live, the life of the church, and the realities of Christian life. The entire commentary series is available for purchase as a bundled set! Click Here for more information. James Montgomery Boice (1938-2000) was senior pastor of Tenth Presbyterian Church in Philadelphia, Pennsylvania. He was also president and cofounder of the Alliance of Confessing Evangelicals, the parent organization of The Bible Study Hour, on which Boice was a speaker for more than thirty years.